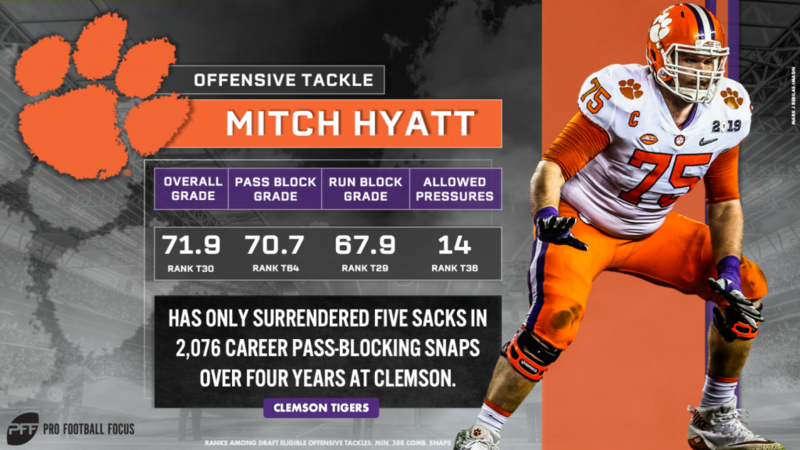 A four-year starter at Clemson and former five-star recruit out of Georgia’s North Gwinnett High School, Mitch Hyatt has quite the resume entering the 2019 NFL Draft. Experience, athleticism, and coachability all stand out as notable strengths, but Hyatt is focused on improving his weaknesses in the final weeks before the draft rather than touting his strengths. In his meetings with NFL teams at the 2019 NFL Scouting Combine, coaches expressed how they wanted him to develop his play strength and toughness to improve his pass protection against power and add some nastiness to his play in the ground game. “I have the strength,” Hyatt said in a March interview with Pro Football Focus. “I guess it’s just applying it better, which is something I’ve been working on a lot. I’m focusing on stopping speed to power [rushes] and working with different [offensive] line guys and learning some different techniques, getting more proficient with things like that. Improving his play strength is what is expected to take Hyatt’s game to the next level and allow him to go beyond the strides he’s already made in recent years. Hyatt’s pass protection improved significantly in Years 3 and 4 at Clemson, as his pass-blocking efficiency jumped to 98.0 and 98.1 in 2017 and 2018, respectively, after finishing below 98.0 in his first two years with the program. His pressure percentage allowed also dropped from 5.3% in 2016 to 3.5% and 3.6% in 2017 and 2018, respectively. Helping him take the next step has been former Atlanta Falcons offensive tackle Todd Weiner, an 11-year player in the NFL with 152 games played and 116 starts in his career. Added explosiveness and quickness is expected to play a pivotal role in taking Hyatt’s run blocking a notch up after earning 74.4-plus run-blocking grades in three of his four years at Clemson. Weiner has worked to add the nastiness to Hyatt’s run blocking NFL coaches asked for in Combine meetings, as well. Whether it’s Weiner, NFL coaches or even his coaches at Clemson, Hyatt willfully takes criticism and advice, knowing his coachability is integral to improving his game at the next level. “I think a big part of my game is the fact that I’m really coachable,” Hyatt said. “I’m athletic. And I think that comes with being coachable. I think having athletic ability makes it easier to apply stuff that’s given to me from coaches. Being able to apply that to the field really quickly is one of my strengths. Never settling in his strengths, never calling himself a finished product, the constantly improving Hyatt should draw considerable interest in late April.